Owen Biddle published his Young Carpenter's Assistant in 1805 in Philadelphia, PA. He included 2 house designs as teaching tools. Biddle wrote that his drawings were not meant to be "eligible for the builder". Instead they were "aiming at instruction for the student". What geometry did Biddle use? Here is his "small house" - Plate 36. 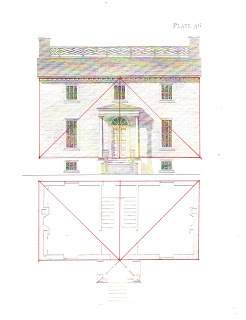 The layout is 2 squares side by side for the plan and the elevation. 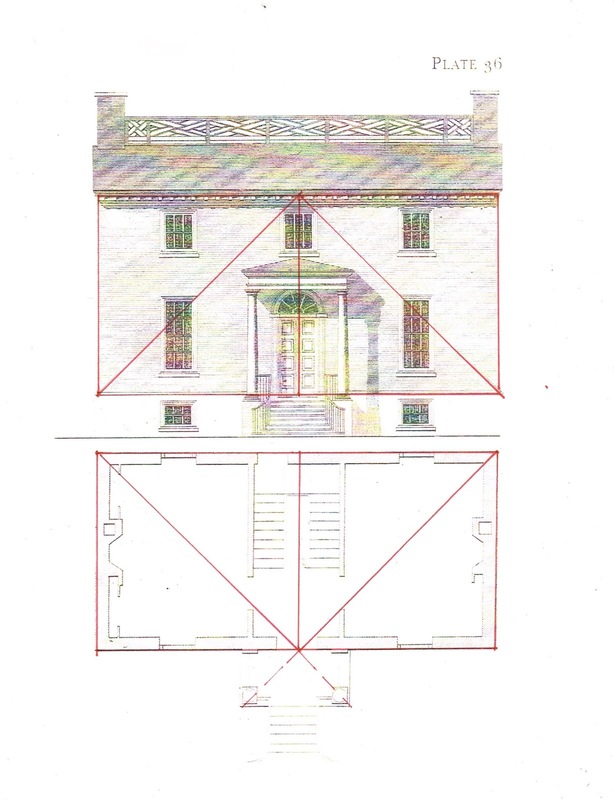 The elevation measures the square from the first floor to the top of the brick coursing. He writes that the student "suppose the building to be raised just above the principle floor, and the wall made level all around." I enjoyed this because a contractor today still wants his foundation and first floor level before he starts his partitions, of course! Note on the plan that the depth of the front porch is determined by extending the diagonals. Usually I draw both diagonals to denote a square. Here since I will be adding other lines I decided to simplify for legibility. Biddle designs using the square divided into quarters. 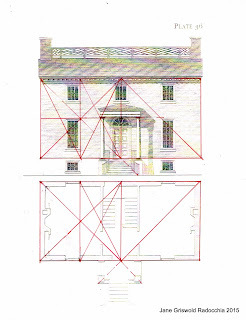 On the elevation the top of the first floor windows is determined by the horizontal center line. 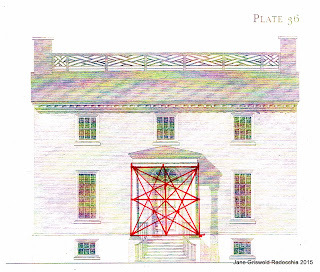 The placement of the windows is determined by the vertical center line. The floor plan follows the same geometry. The edge of the window frame is determined by the vertical center line. Still using the squares, Biddle divides one half in half again, vertically. 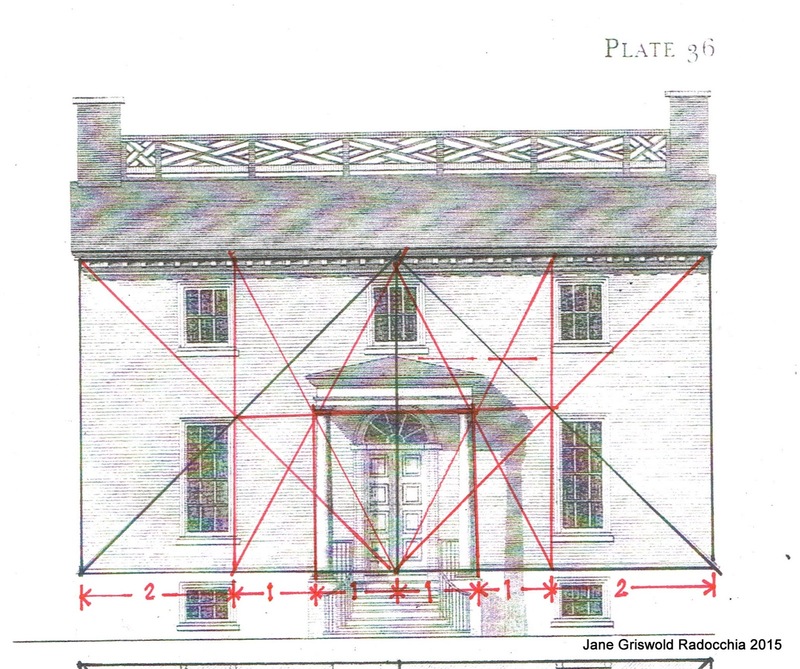 This locates the columns - and the size of the front porch - at the 3/4 mark of the squares on each side. Note that the horizontal center line dictates not the top of the fan light casing but the height of the brickwork. 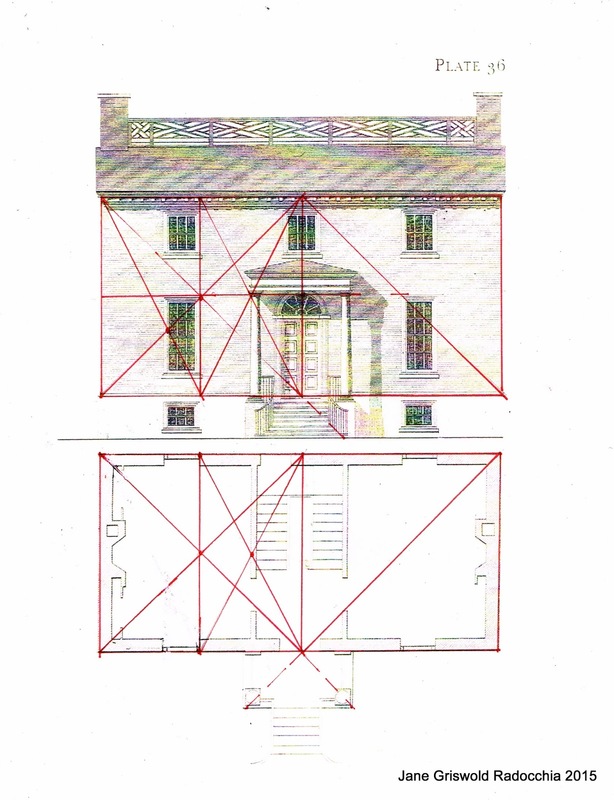 These are structural dimensions, information for the brick layer, the sash maker. The curve of the entrance stair follows the diagonal. The width of the window is determined by the intersection of the diagonals. On the floor plan the right hand side of the square is divided in half; it determines the location of the wall between the rooms and the hall. The porch is 1/4 of the square. Here I have drawn the lines that layout the portico in red and given the pattern of the division across the bottom: 2-1-1-1-1-2. 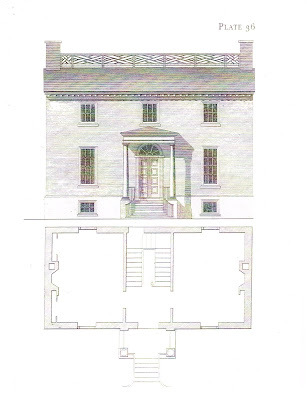 The architrave and the roof are 1/3 of the square of the porch. When I first saw this I thought the portico and the doorway used the rule of thirds. I was wrong. The door itself may be 1/3 of the porch, but the casing around the door is placed at 1/4 the width of the porch. The height of the fan light is 1/4 of the square; the door below 3/4. Note the shadow to the right of the porch. Biddle wanted his book to teach drawing and presentation. He tells the student (reader) to "enliven the drawing by giving the appearance of shadow". (Plate 36). This house was an exercise, just as Asher Benjamin's were. The geometry he uses comes naturally and easily, Although he knows the rule of thirds he barely uses it. He does not use crossed squares. Benjamin uses both. 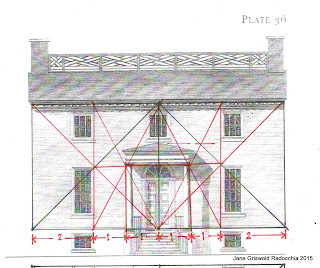 This is not the geometry seen in New England nor in the folk houses documented by Glassie. It might be the geometry of Philadelphia.